While the LHC experiments are surely turning their attention towards the 2015 run of the collider, at an energy nearly double that of the previous run, we’re also busy trying to finalize and publish measurements using the data that we already have in the can. Some measurements just take longer than others, and some it took us a while to get to. And while I don’t like tooting my own horn too much here at the US LHC blog, I wanted to discuss a new result from CMS that I have been working on with a student, Dan Knowlton, here at the University of Nebraska-Lincoln, along with collaborators from a number of other institutions. It’s been in the works for so long that I’m thrilled to get it out to the public! The most common production mechanism has a Higgs being produced with nothing else, but it can also be produced in association with other particles. In our new result, we search for a Higgs production mechanism that is so much more rare that it doesn’t even appear on the above plot! The mechanism is the production of a Higgs boson in association with a single top quark, and in the standard model, the cross section is expected to be 0.018 pb, about an order of magnitude below the cross section for Higgs production in association with a top-antitop pair. Why even bother to look for such a thing, given how rare it is? 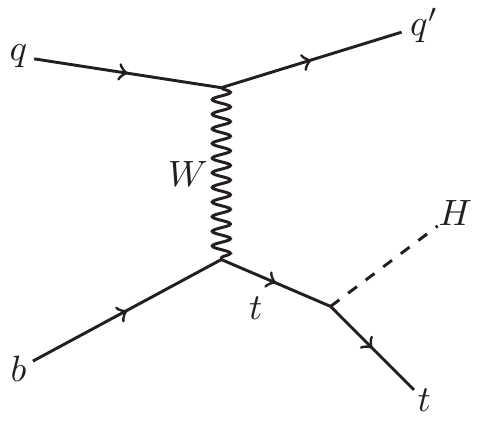 In one case, the Higgs is radiated off the virtual W, while in the other it comes off the real final-state top quark. Now, this is quantum mechanics: if you have two different ways to connect an initial and final state, you have to add the two amplitudes together before you square them to get a probability for the process. It just so happens that these two amplitudes largely destructively interfere, and thus the production cross section is quite small. There isn’t anything deep at work (e.g. no symmetries that suppress this process), it’s just how it comes out. At least, that’s how it comes out in the standard model. 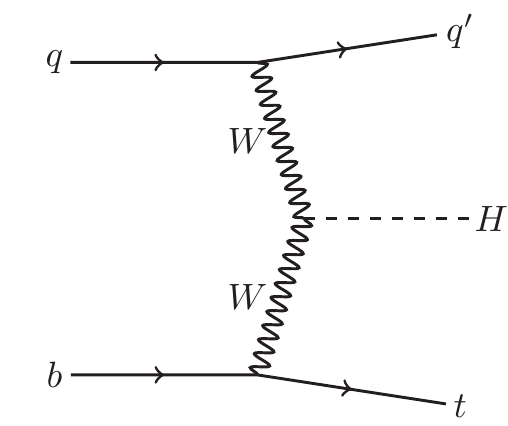 We assume certain values for the coupling factors of the Higgs to the top and W particles that appear in the diagrams above. Other measurements of Higgs properties certainly suggest that the coupling factors do have the expected values, but there is room within the constraints for deviations. It’s even possible that one of the two coupling values has the exact opposite sign from what we expect. In that case, the destructive interference between the two amplitudes would become constructive, and the cross section would be almost a factor of 13 larger than expected! The new result from CMS is a search for this anomalous production of the Higgs in association with a single top quark. CMS already has a result for a search in which the Higgs decays to pair of photons; this new result describes a search in which the Higgs decays to bottom quarks. That is a much more common Higgs decay mode, so there ought to be more events to see, but at the same time the backgrounds are much higher. The production of a top-antitop pair along with an extra jet of hadrons that is mis-identified as arising from a bottom quark looks very much like the targeted Higgs production mechanism. The top-antitop cross section is about 1000 times bigger than that of the anomalous production mechanism that we are looking for, and thus even a tiny bottom mis-identification rate leads to a huge number of background events. A lot of the work in the data analysis goes into figuring out how to distinguish the (putative) signal events from the dominant background, and then verifying that the estimations of the background rates are correct. The analysis is so challenging that we predicted that even by throwing everything we had at it, the best we could expect to do was to exclude the anomalous Higgs production process at a level of about five times the predicted rate for it. When we looked at the data, we found that we could exclude it at about seven times the anomalous rate, roughly in line with what we expected. In short, we do not see an anomalous rate for anomalous Higgs production! But we are able to set a fairly tight limit, at around 1.8 pb. What do I like about this measurement? First, it’s a very different way to try to measure the properties of the Higgs boson. The measurements we have are very impressive given the amount of data that we have so far, but they are not very constraining, and there is enough wiggle room for some strange stuff to be going on. This is one of the few ways to probe the Higgs couplings through the interference of two processes, rather than just through the rate for one dominant process. All of these Higgs properties measurements are going to be much more accurate in next year’s data run, when we expect to integrate more data and all of the production rates will be larger due to the increase in beam energy. (For this anomalous production process, the cross section will increase by about a factor of four.) In this particular case, we should be able to exclude anomalous Higgs couplings through this measurement…or, if nature surprises us, we will actually observe them! There is a lot of fun ahead for Higgs physics (and top physics) at the LHC. I’ve also really enjoyed working with my CMS colleagues on this project. Any measurement coming out of the experiment is truly the work of thousands of people who have built and operated the detector, gotten the data recorded and processed, developed and refined the reconstruction algorithms, and defined the baselines for how we identify all kinds of particles that are produced in the proton collisions. But the final stages of any measurement are carried out by smaller groups of people, and in this case we worked with colleagues from the Catholic University of Louvain in Belgium, the Karlsruhe Institute of Technology in Germany, the University of Malaya in Malaysia, and the University of Kansas (in Kansas). We relied on the efforts of a strong group of graduate students with the assistance of harried senior physicists like myself, and the whole team did a great job of supporting each other and stepping up to solve problems as they arose. These team efforts are one of the things that I’m proud of in particle physics, and that make our scientists so successful in the wider world.